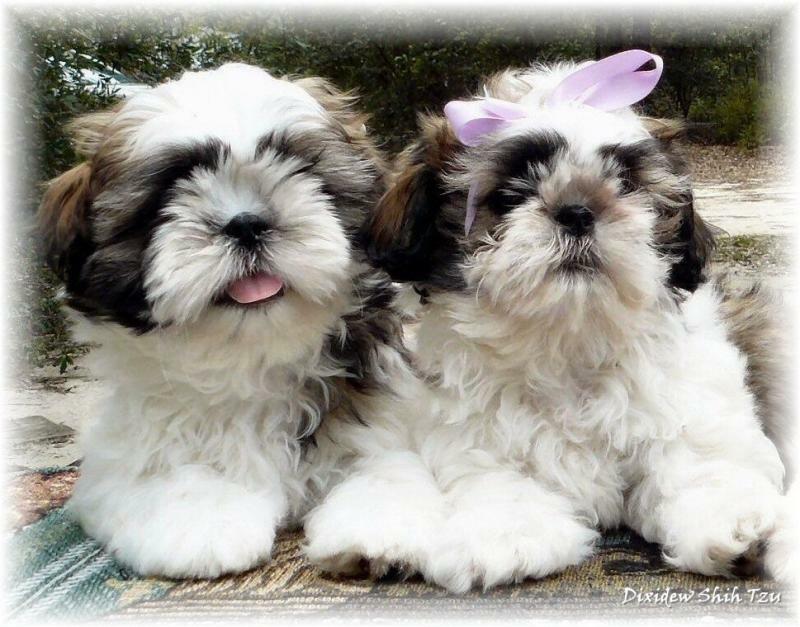 A Georgia Shih Tzu breeder of quality Shih Tzu puppies for the love and betterment of the breed. Information offered to families interested in this animated and adorable toy dog! 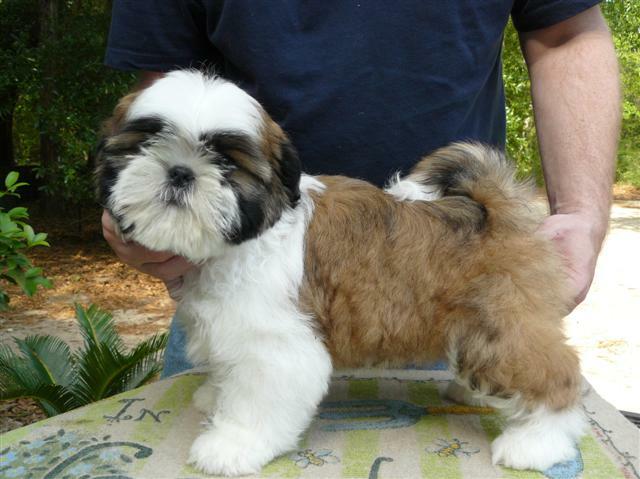 Shih Tzu puppies for sale in GA and boarding states of FL AL TN SC NC. We are centrally located in the southeastern USA, in south central Georgia which is convenient driving distance from several metropolitan areas such as Atlanta, Macon, Augusta, Duluth, Savannah GA, Birmingham AL, Tallahassee, Jacksonville, Gainesville FL, Nashville TN, Charlotte, Asheville NC, Hilton Head Island SC and the surrounding cities and others. From the ancient, Imperial Palace of China to modern day America! 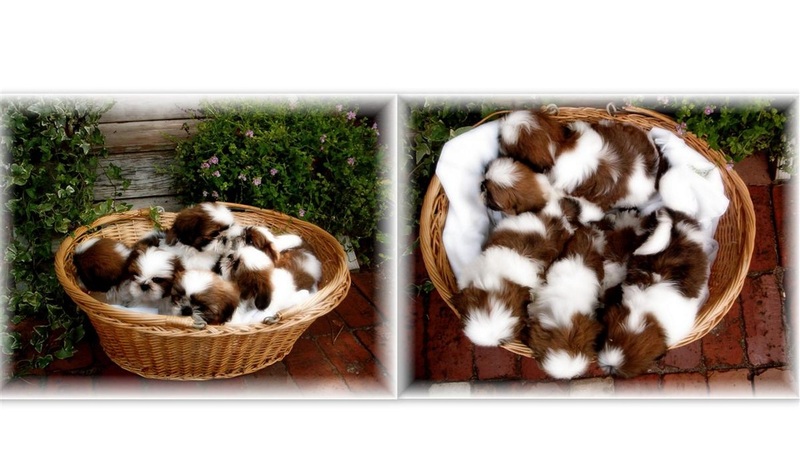 "Where unequivocal excellence is the prerequisite"
Showcasing remarkable and adorable purebred Shih Tzu toy dogs and puppies! characteristics of the breed in conformation and temperament to the uttermost. 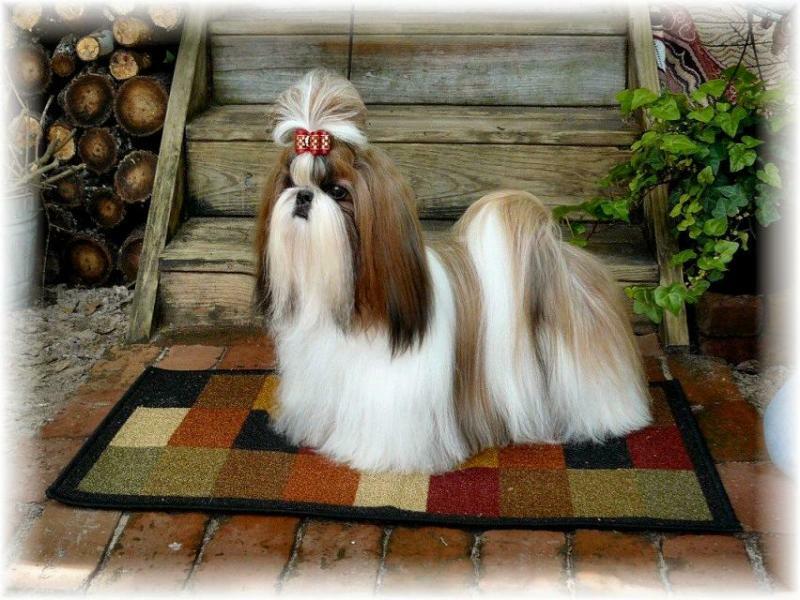 Tallis, Symarun, Lun Lynn and other world renowned Shih Tzu show kennels. Email, would love to talk Shih Tzu with you! My beautiful Shih Tzu boy Champion Ziggy. 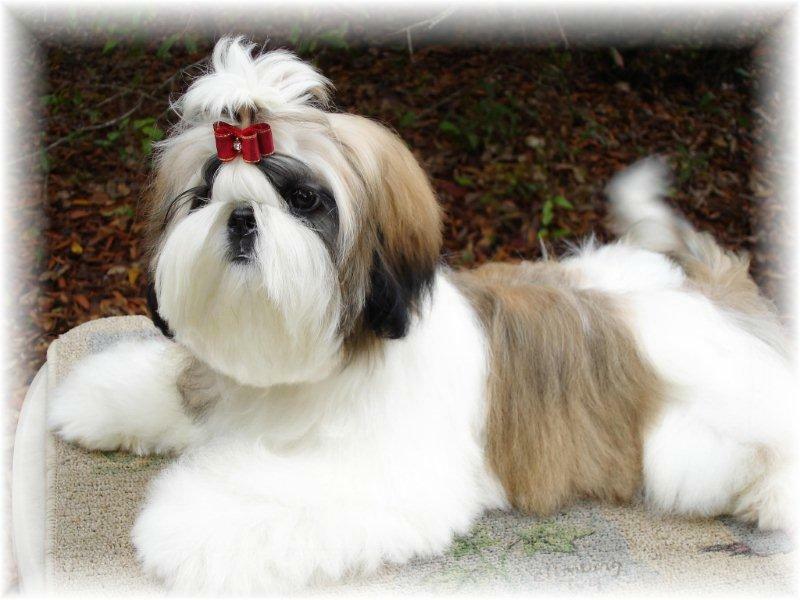 Site, all dogs, and pictures owned and maintained by Sheri Smith - Dixidew Shih Tzu GA -- Copyright © All Rights Reserved. 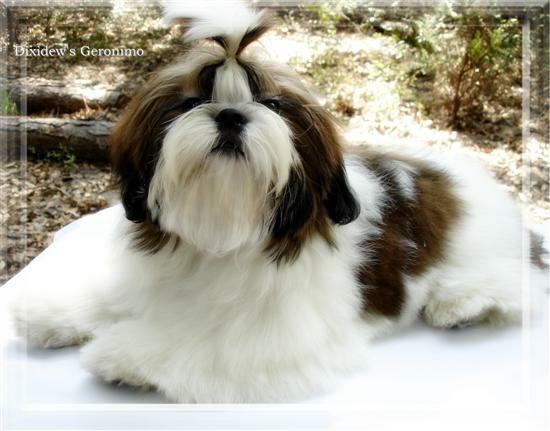 Champion sired gold and white Shih tzu puppy at 6 months old GA FL Shih Tzu. 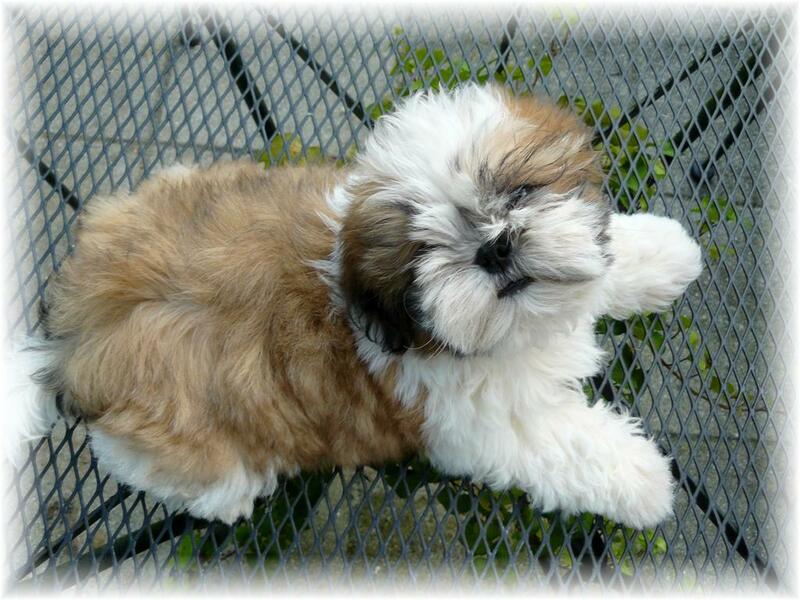 Georgeous gold and white Champion sired Shih Tzu puppy at 12 weeks old. 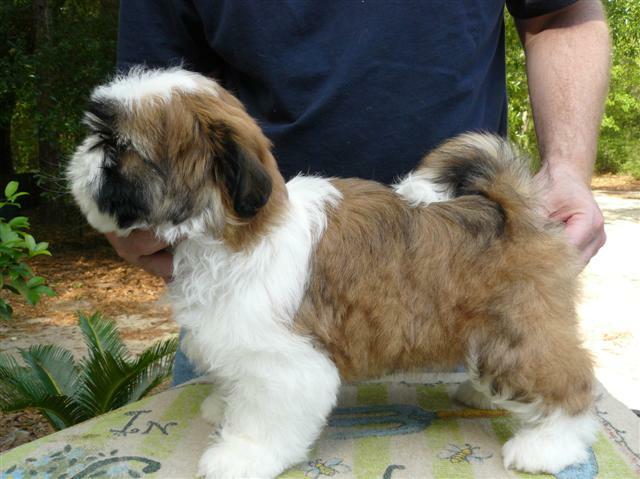 Beautiful Shih Tzu profile of Champion sired Shih Tzu puppy. 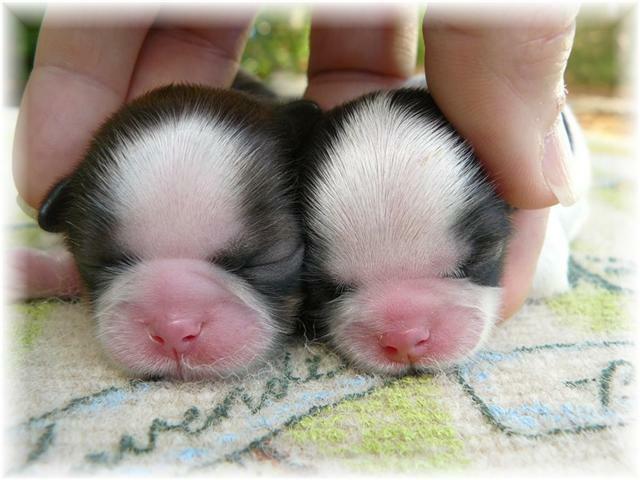 Precious newborn Shih Tzu puppies with beautiful symmetrical facial markings. 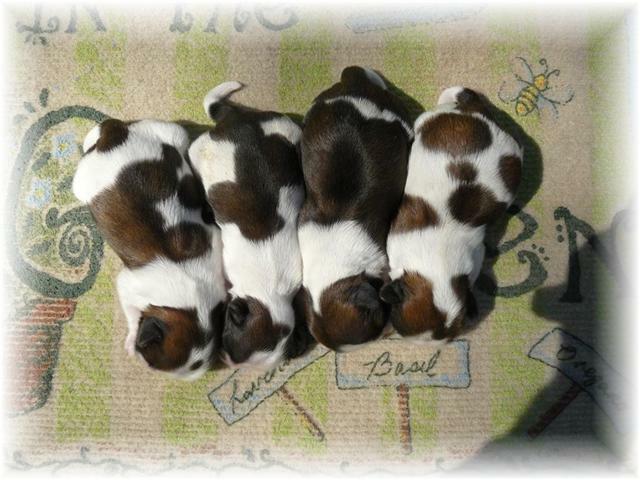 Healthy infant shih tzu puppies in GA - parti colors. 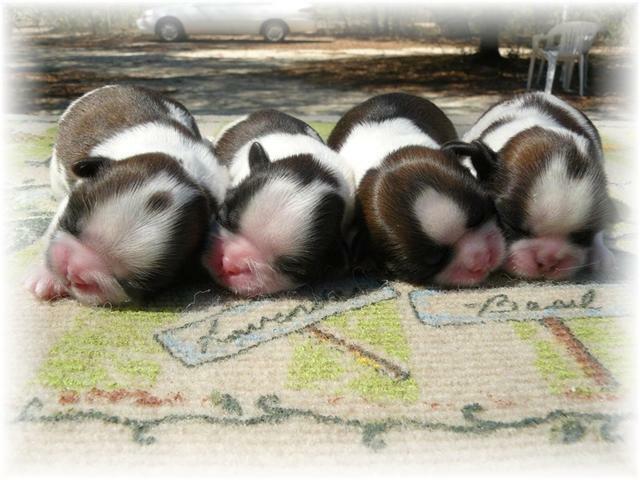 Fat, healthy and beautiful gold and white newborn Shih Tzu boys and girls for sale in GA FL AL TN SC NC. Gorgeous red and white Shih Tzu show dog Geronimo. Gorgeous red and white Shih Tzu boy Geronimo in full show coat in GA. 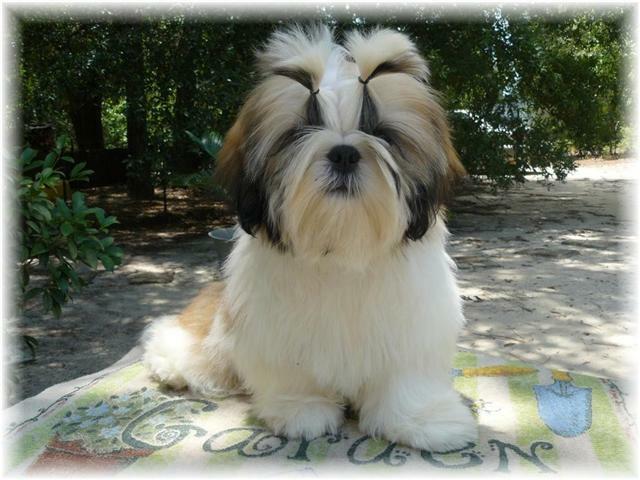 Stunning gold and white Shih Tzu puppies in GA FL AL TN SC NC. 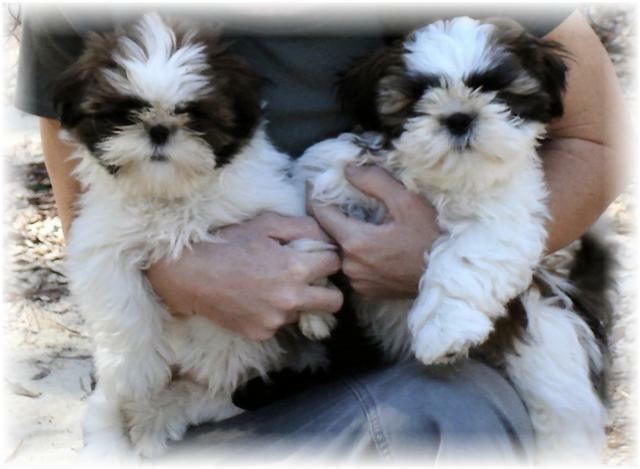 Girlfriend and Commotion - red and white and gold and white with black markings shih tzu puppies in GA.
Geronimo - shih tzu puppy in ga as at around 16 weeks old. 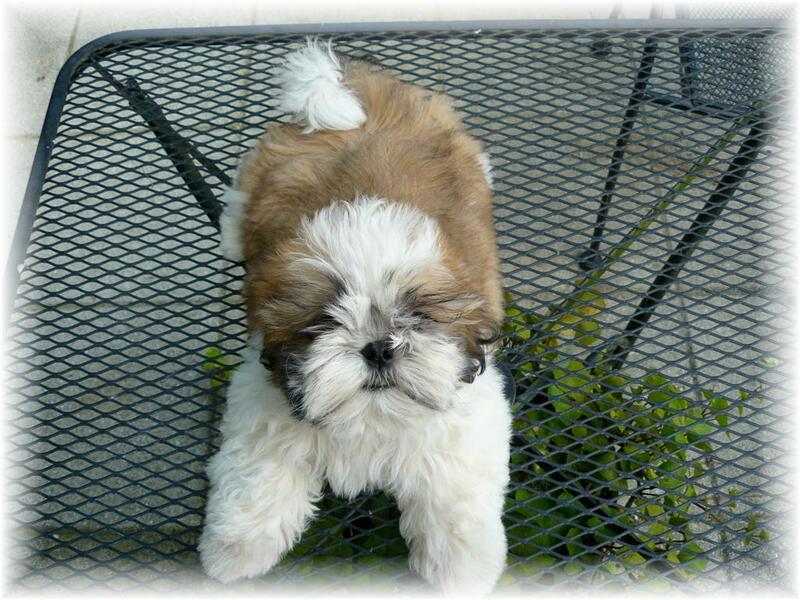 Commotion as a shih tzu puppy at 12 weeks old. after winning a MAJOR win at an AKC DOG SHOW. A MAJOR WIN by a OWNER HANDLER BREEDER is a great achievement, and can't be noted by many breeders outside of professional handlers. 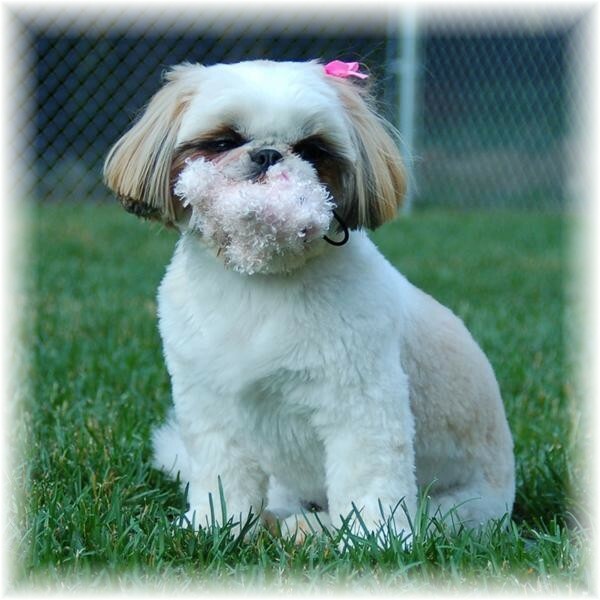 Below is the Official Shih Tzu Breed Standard as set forth by the ASTC and endorsed by the AKC. are broad, wide, and open. Pigmentation - Nose, lips, eye rims are black on all colors, except liver on liver pigmented dogs and blue on blue pigmented dogs. Fault: Pink on nose, lips, or eye rims. Bite - Undershot. Jaw is broad and wide. A missing tooth or slightly misaligned teeth should not be too severely penalized. Teeth and tongue should not show when mouth is closed. Fault: Overshot bite. Shoulders - Well-angulated, well laid-back, well laid-in, fitting smoothly into body. Legs - Straight, well-boned, muscular, set well-apart and under chest, with elbows set close to body. Pasterns - Strong, perpendicular. Dewclaws - May be removed. Feet . Firm, well-padded, point straight ahead. The Shih Tzu moves straight and must be shown at its own natural speed, neither raced nor strung-up, to evaluate its smooth, flowing, effortless movement with good front reach and equally strong rear drive, level topline, naturally high head carriage, and tail carried in gentle curve over back. As the sole purpose of the Shih Tzu is that of a companion and house pet, it is essential that its temperament be outgoing, happy, affectionate, friendly and trusting towards all. 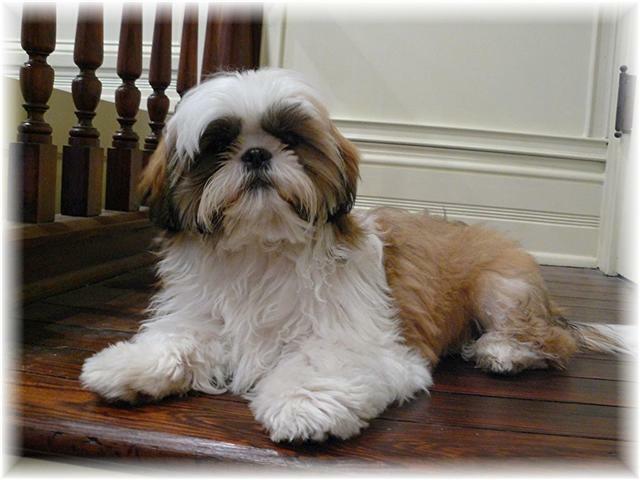 PUPPY-PROOF ENVIRONMENT ~~~ WATER BOTTLES ~~~ CHILDREN & DOGS ~~~ FLEA CONTROL ~~~ BOY OR GIRL SHIH TZU? Dixidew Shih Tzu of Georgia focuses on producing Shih Tzu puppies that excel in good health, correct temperaments and structural sounds while providing Shih Tzu puppies for sale to loving homes in Georgia, Florida, Alabama, South Carolina, North Carolina, Tennessee and beyond. All Shih Tzu are not created equal. 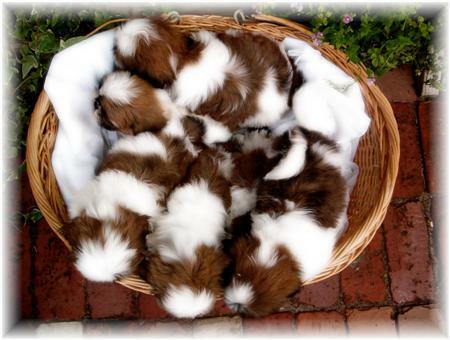 Breeding Shih Tzu puppies that are well conformed to the breed standard is an effort that involves educating oneself in the study of the standard and the breed. Attending and exhibiting in dogs shows in the southeast has been a tool in this learning process. Seeing Shih Tzu in the show ring and on the show table enables one to gain a perspective in critiquing Shih Tzu dogs and puppies that is not easily gained otherwise. Conversing with fellow breeders and exhibitors aids one in many aspects also. Shih Tzu toy dogs and puppies that conform to the breed standard are what responsible breeders strive to produce in their breeding programs. 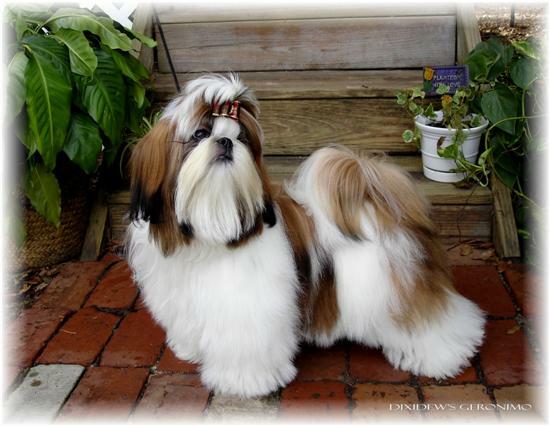 Dixidew Shih Tzu has a foundation of excellent bloodlines from around the world and desires to perpetuate Shih Tzu of the highest quality possible. Quality doesn't come by happenstance, but by intentional efforts based on education and quality breeding stock. 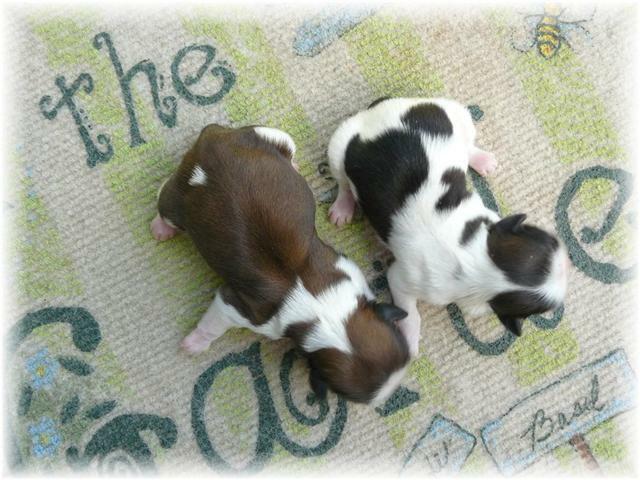 There is a difference in good quality and poor quality and it is recognizable to those that know the breed. 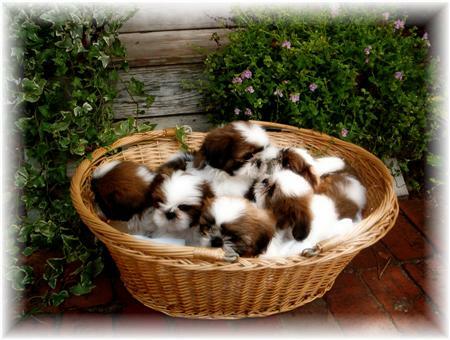 There is no substitution for quality when it comes to acquiring a Shih Tzu puppy. There are essential factors that go into breeding correct dogs to produce beautiful Shih Tzu with loving personalities for the pleasure and enjoyment of their owners for the many years to come. Georgia red and white gold and white Shih Tzu male and female puppies. Copyright 2014 Dixidew Shih Tzu. All rights reserved. Copyright 2012 Dixidew Shih Tzu. All rights reserved.